I am very excited for this expansion; more so than Boomsday and certainly more than Witchwood and its Rush keyword, which was a bit of a flop. Despite the new Overkill keyword, I don’t see any Overkill cards having a meta-breaking impact outside of Arena. However, I do believe they can counter zoo and aggro decks. Prior to Boomsday, I made a list of cards that I believed would be either super strong or meta-changing, and I was certainly off on a few accounts, completely missing Giggling Inventor and Zilliax. During Boomsday, I improved at the game and managed to place top 1000 Legend with Odd Rogue. With that being said, my knowledge of the game and awareness of what cards can flourish has improved, and I believe that these will be the 10 strongest cards of Rastakhan’s expansion. This card is awesome, and has insane combo potential with cards such as devilsaur egg, which I believe can make way into Zoo Warlock decks. 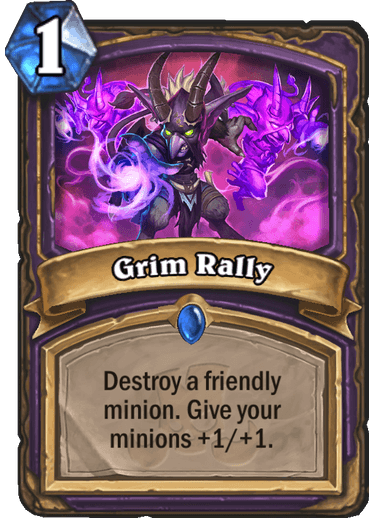 Grim Rally generates positive value if even if only a couple of minions occupy your board. With only 1 mana cost, you can quickly ramp up early game boards to out-aggro opponents with Zoos of minions, especially after Keleseth buffs. Important to note that this card has clear combo potential with Hi’reek the Bat as well! This card should appear in every Deathrattle Hunter deck, maybe even Midrange Hunter. Being able to resummon Cubed minions as well as Devilsaurs that might have traded into big threats can create huge swings at the cost of TWO mana. That is insane value even if you revive a single devilsaur. Reviving Witchwood Grizzlies will also grant them the full 12 health as opposed to the reduced battlecry. It will most likely be a replacement for Prince Keleseth in Deathrattle decks, especially since we can squeeze 2 of these into a deck, setting up numerous opportunities to revive big minions. 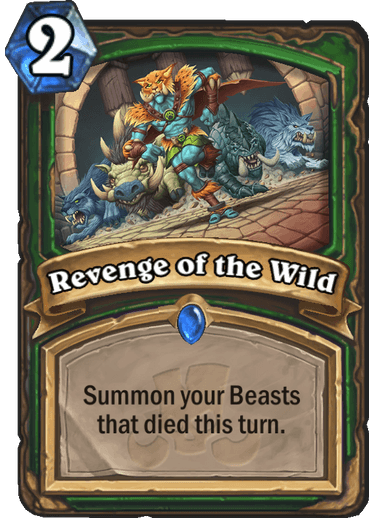 This card is insanely strong, very easy to generate positive value, and will be a game-changer for Deathrattle Hunter. This is the ultimate anti-combo card. Destroying half of your opponents deck can often times be a win condition in itself against decks that need one or two specific cards to win – again, combo decks. Mecha’thun, Shudderwock, Malygos, Togwaggle. These cards, once eliminated, are pretty much instant concedes from your opponent. However, if you fail to destroy the combo card, or those that pair with it, you give your opponent an easier time to execute the play. Luckily, you can include two of these cards in a deck, allowing you to further foil your opponents plans to combo. 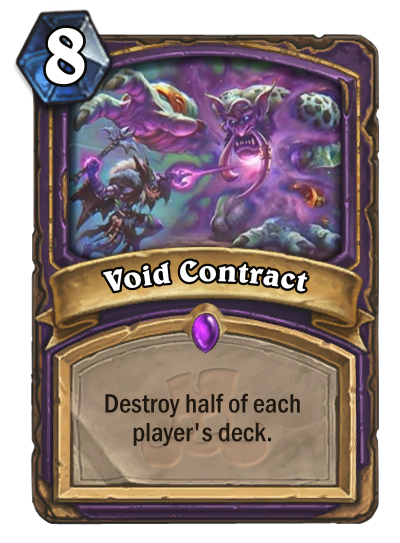 Gnomeferatu, as well as Rin, the Last Disciple, will be seen alongside Void Contract. Anti-combo Warlock can quite possibly be better than ever thanks to this card. A new Hero card for Hunter. A Shudderwock for spells. 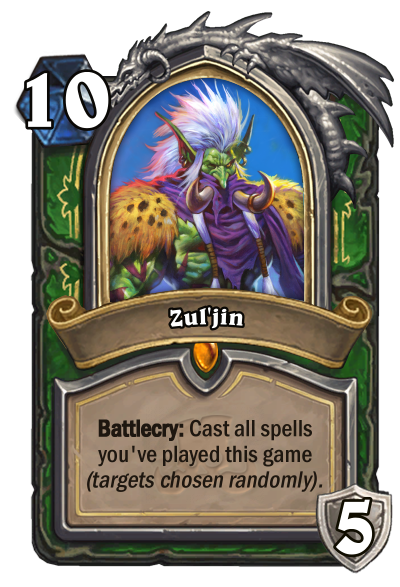 Zul’jin is an incredible late-game card for Spell Hunter, that can really push a board to topple your opponent. Much like Yogg-saron, Zul’jin creates insane value from all of the spells you’ve casted, except rather than Yogg’s random spells, Zul’jin simply casts them again, allowing a board full of wolves, animal companions, and secrets as well. Not to mention you get an improved hero power, letting you deal 2 damage to minions and not just face damage. This is the card that I am most reluctant to put on this list. In Odd Mage, you can get Ragnaros out pretty quickly, especially with new cards that boost your hero power’s ability. Zola the Gorgon can copy Jan’alai and allow you to get a second Ragnaros without having to repeat the labor of the battlecry. 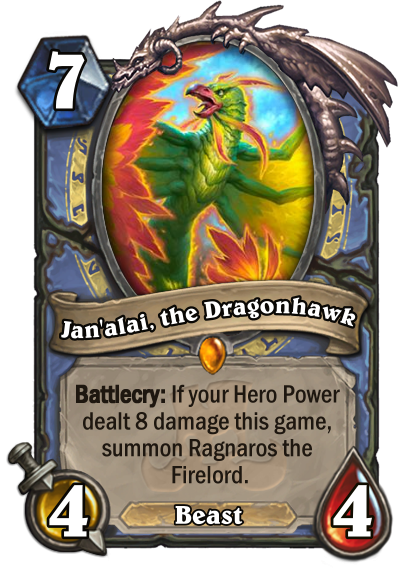 Of course, in Odd Mage, Jaina will also be an include, allowing you to give Ragnaros lifesteal for a great late-game hold. This card can definitely perform well, but it is hard to say whether or not this new Mage archetype will excel. Heal Paladin has no choice but to become relevant thanks to this card. 29 Armor on turn 3 is ridiculous, and with cards such as Shrivallah, Zilliax, and healing spells, Paladin can hold out for a long enough time to pull off some great late game combos, which I will elaborate on at card #2. Perhaps Uther’s Death Knight will even make an appearance in some decks as well. 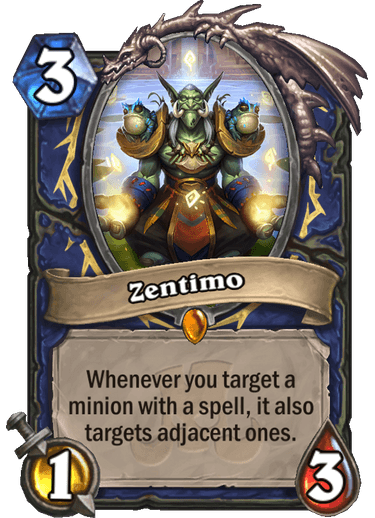 It was hard to determine whether or not this will be a more powerful card then Zentimo, but after realizing that Zentimo fits into practically every Shaman deck as opposed to Bog Slosher’s one, Zentimo made the top 3 cut. However, this card is absolutely insane and will be the bane of aggro decks existence as this card single-handedly gives Shudderwock Shaman a massive buff. 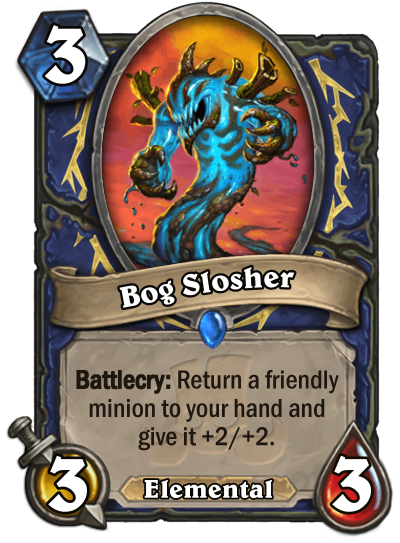 Good stating, with an excellent battlecry to boot, Bog Slosher can return minions while simultaneously boosting them, which sets up for even more powerful Shudderwock combos at the end of the game. Cards such as Saronite Chain Gang will be the best target for Bog Slosher, giving players TWO 4/5 minions as opposed to the standard 2/3 2/3 Saronite duo. Zola the Gorgon can help return Bog Slosher or a Saronite, thus walling out aggressive decks until the infamous Shudderwock dominates the late game. This card will be so annoying to deal with, and there is no doubt in my mind that it will make Shudderwock more powerful than it already is. Another Shaman card makes top 4 on the list. For 7 Mana with Zentimo, you can Hex 3 minions. This puts a stop to big threats such as Deathrattle Hunter, Taunt Druid, Even Warlock. In Token Decks, Zentimo can be used to multiply Unstable Evolution, as well as Rockbiter’s with Electra Stormsurge. This card has insane potential and will definitely be exciting to watch in tournament play. You can’t really go wrong adding Zentimo to your deck. He is certainly a Shaman staple for all archetypes. At first glance, I saw Shirvallah as a solid staple to spell-based Paladin decks, such as Quest Paladin. You are guaranteed 7 damage of lifesteal at the very least, and can typically buff Shirvallah to make her and her lifesteal ability last for some time, assuming that she is being summoned for cheap cost. However, it wasn’t until recently that I had stumbled upon a combo that has been spreading across social media: Holy Wrath + Shirvallah. Holy Wrath draws a card and deals damage based on its cost. Shirvallah costs 25 mana, which means for 5 mana, you can deal 25 damage, and since Holy Wrath can be added into a deck twice, by drawing a second Shirvallah, you can deal 50 damage for 10 mana. So how do make sure that we draw Shirvallah from our deck? With the help of Baleful Banker, we can put a copy of Shirvallah into our deck for only 2 mana after our deck has been drawn, and using a second Banker, we can place a second Shirvallah copy into our deck, allowing us to double Holy Wrath for 50 damage. 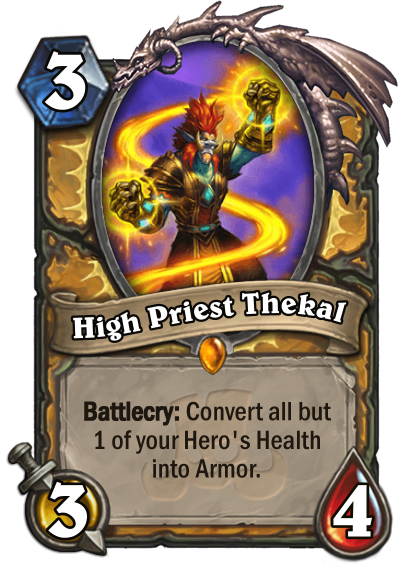 On top of that, we can Augmented Elekk, which lets us put extra Shirvallahs into our deck. Elekk + 2 Bankers = 7 Mana, which makes for a perfect use of the new Paladin spell, Time Out. Paladins new survivability makes pulling off the combo a lot easier as well as help it survive against Aggro decks. This deck is also fairly cheap aside from Shirvallah. So if you’re on a budget this might be a deck to look out for. The first card I fell in love with upon release. This card has absolutely ridiculous potential in Rogue: double Edwin Van Cleefs, double Pogo Hoppers, double Fal’dorei Strider, double Cold Blood. Mossy Horror and Void Ripper counter this card, but other than those minions, as well as AoE spells such as Hellfire and Flamestrike, it is hard to eliminate Spirit of the Shark before your opponent creates a devastating combo for a massive swing. I see this card being insanely strong in both Standard and Wild. Meta-breaking for sure. 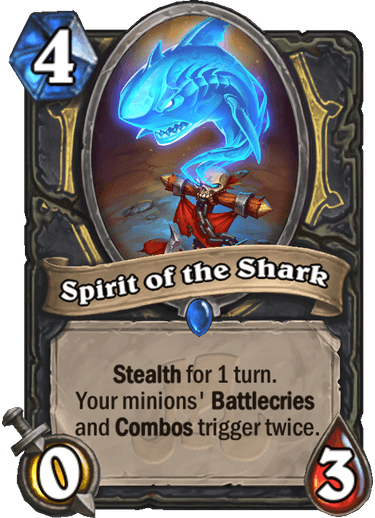 It was be a lot of fun to see what creative combos players come up with around Spirit of the Shark.